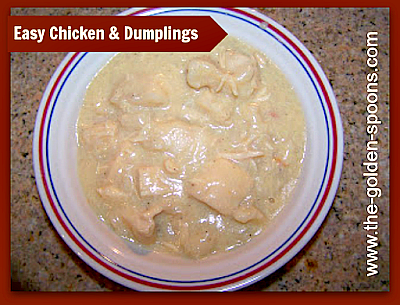 The Golden Spoons: Easiest Chicken and Dumplings EVER!!!! I know that winter is coming to an end (Thank Goodness!) and that means menu planning will begin to incorporate more burgers, pasta salads, and other lighter fare. However, I believe there is always room for good comfort food and since Spring is only almost here, you should definitely try this recipe in these last few weeks of winter. THANK YOU for this recipe! I made it tonight, and as promised, it was easy AND yummy. The whole family loved it, including my picky boys. Another great thing: there was a lot leftover, which means less cooking for me! :) I'm looking forward to making your Cheesy Chicken recipe next.